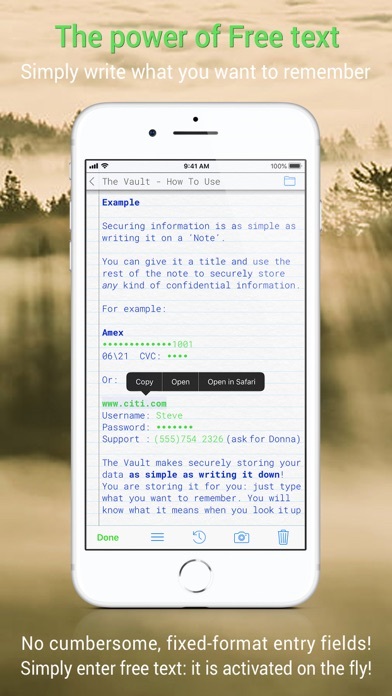 The Vault provides straightforward, easy to use, secure storage for all your documents and other data, such as passwords, login credentials and any other confidential information. 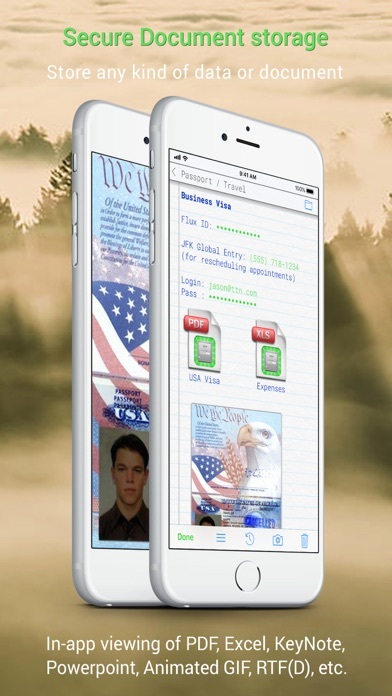 It can securely store any number of documents, images, screenshots or photos along with your confidential information. 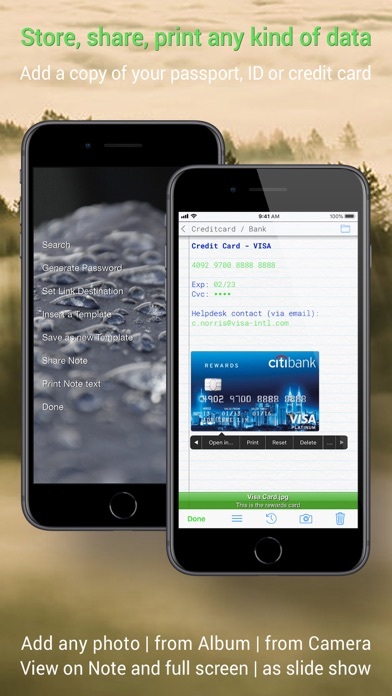 (Some other - payed - apps do too, but some apps advertised as "secure" really do not, and for example save your data using a simple base-64 encoding: your information looks scrambled, but is as readable as plain text when you know how). ▸ The Vault will - never - show ad banners! We hate them too. ▸ The Vault stores information on * your * device. Not on some server somewhere on the net. 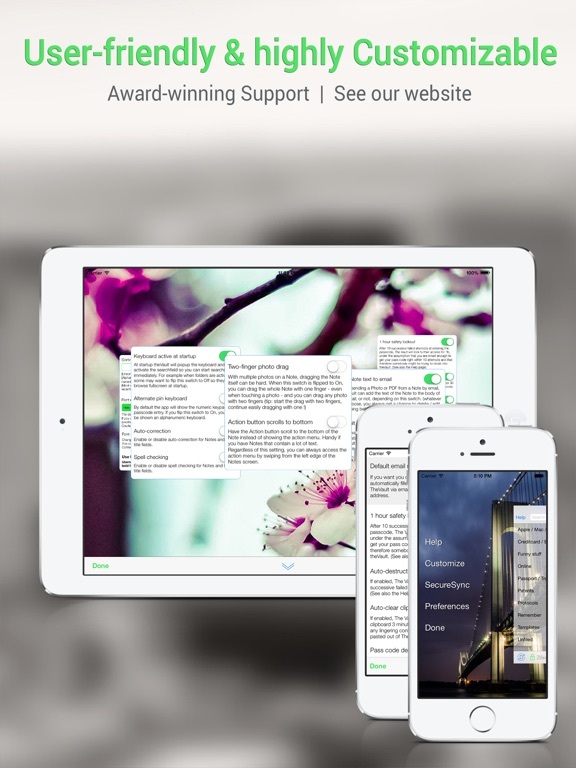 ▸ Securely storing information is as simple as entering free text! 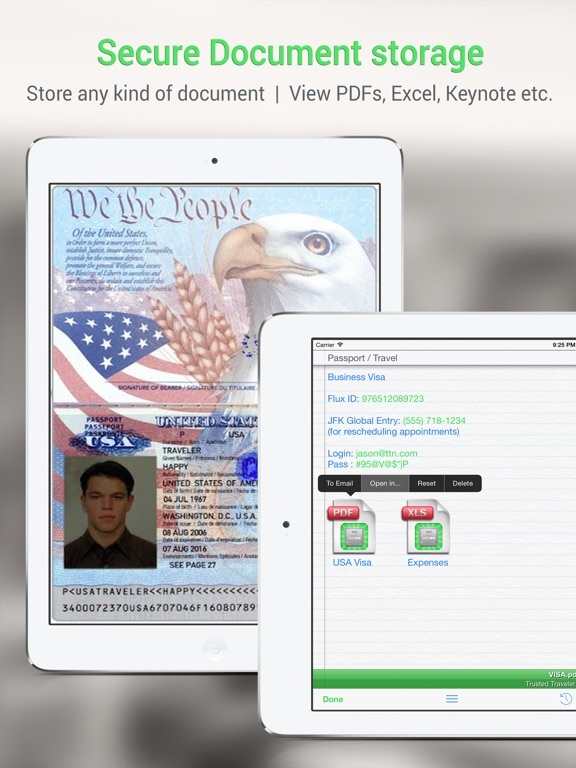 ▸ The Vault can securely store photos and pictures from your camera or photo library; for example a copy of your passport, credit card, or just the serial numbers of some equipment you own. Anything. ▸ Many secured documents can be viewed directly from The Vault, including PDFs, Keynote, Numbers, Pages, Powerpoint, Excel and Word files. ▸ You can optionally import data exported from your previous password app (or any other source that can provide the data). 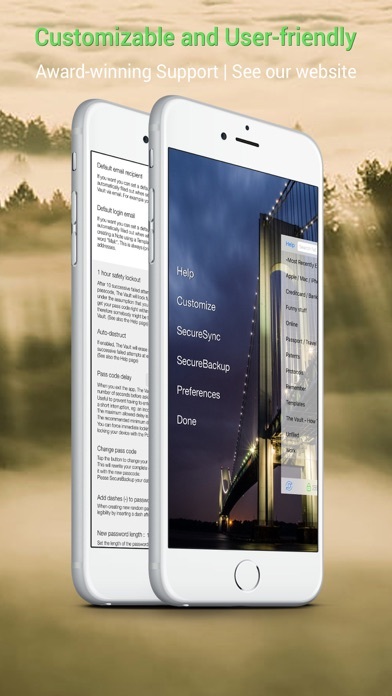 ▸ Automatically and securely backups your data! Claiming “military-grade” (or “industry standard” ;-) encryption is meaningless. 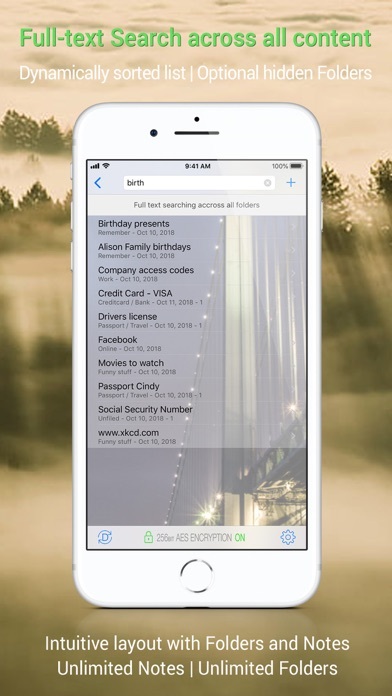 ▸ NEW: Passcode AutoFill ! 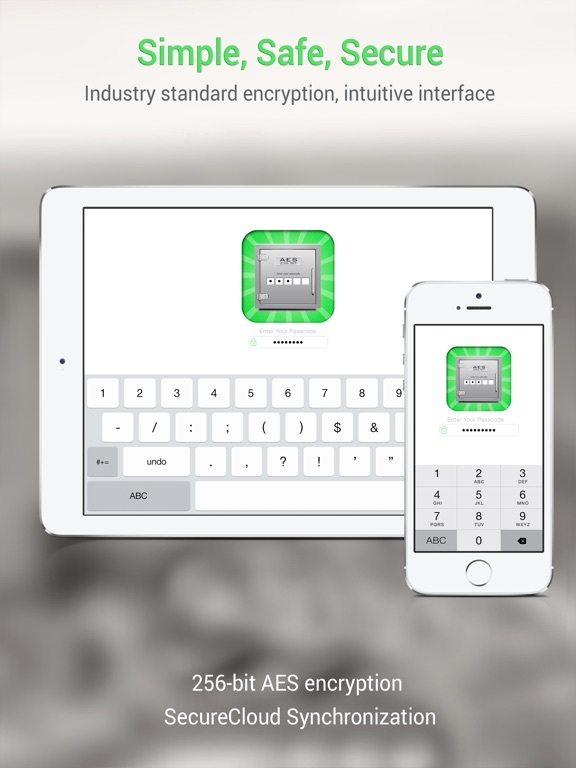 Login to any website or app using your credentials stored in The Vault. + NEW: Deep-copy HotContent: Long-press an InterNote Link to directly copy a password from a linked Note, without leaving your current open Note. And not just passwords. You can deep-copy any content from a linked Note. ▸▸▸ NEW: InterNote Links ! 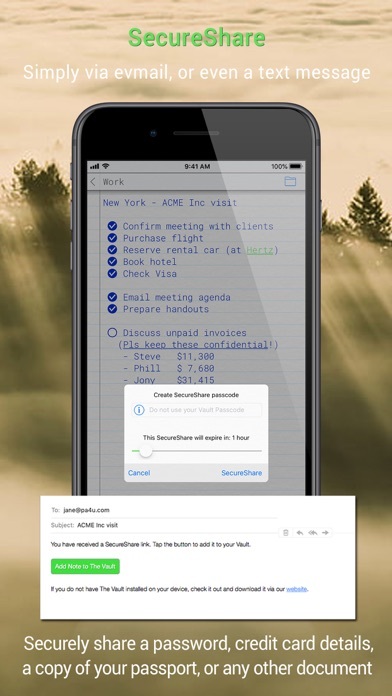 Add meaningful connections between your Notes. Read more inside the app. 3D/ForceTouch The Vault’s icon and start typing. 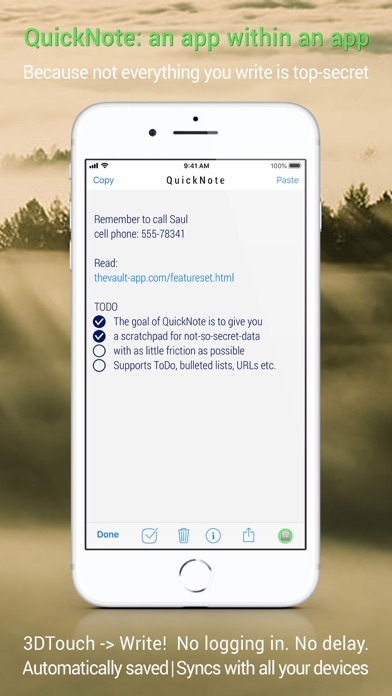 + QuickNote automatically syncs between your devices. For everyone. 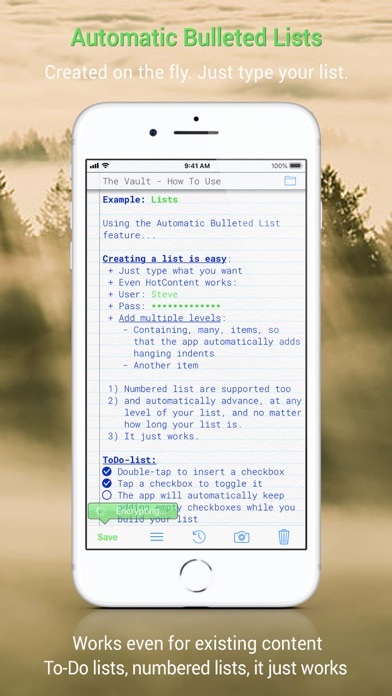 Type what you want to sum up and the app will automatically format your list, add new bullets and track indentation; intelligently. ...annotate, filter, blur, curves, effects, crop, etc. 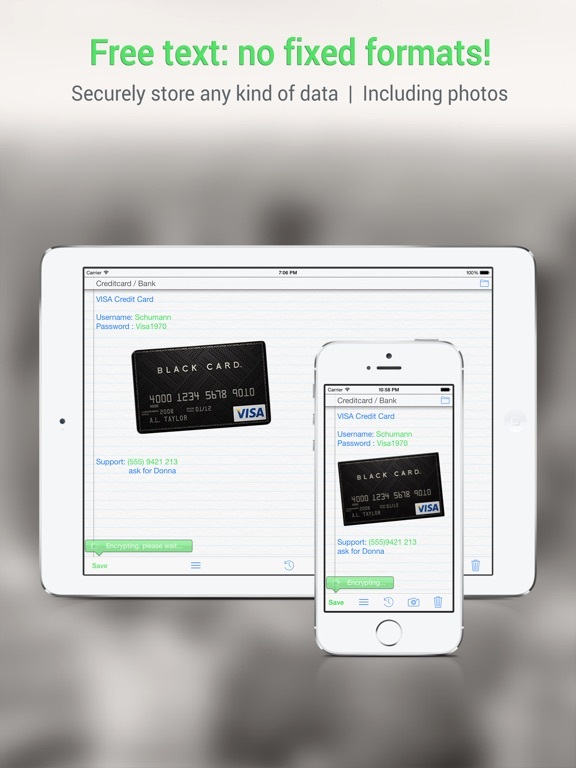 ...and then either securely store it in The Vault, or write it back to your camera roll! + Open-sourced The Vault's encryption core and published it online in human-readable pseudocode. + Improve HotContent parsing of answers to online security questions and Hidden HotContent IDs. 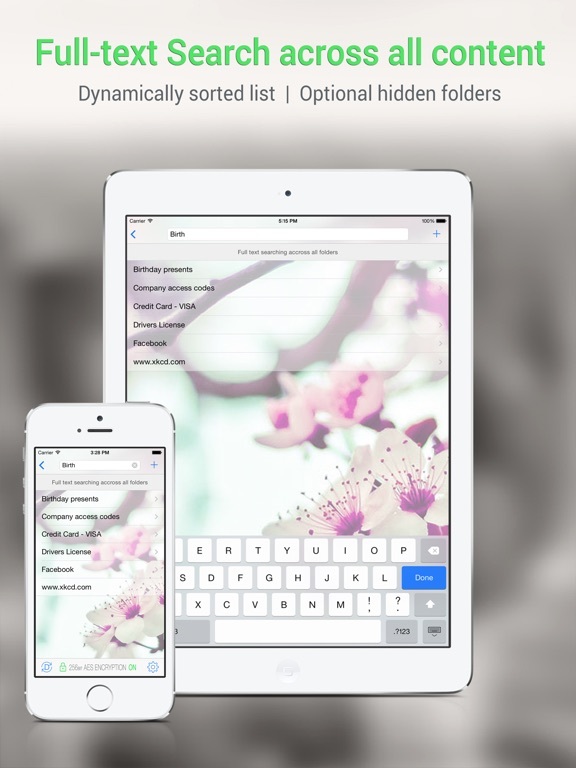 + PDF Preview - Quickly preview, search or print PDF documents sent to The Vault - without having to login. 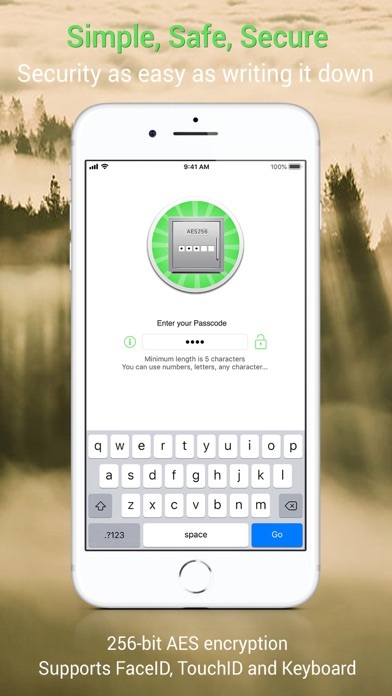 The Vault 5 improves the way keys are derived from your master passcode and how the way these keys are handled within the app. + Auto-hiding of sensitive HotContent ! 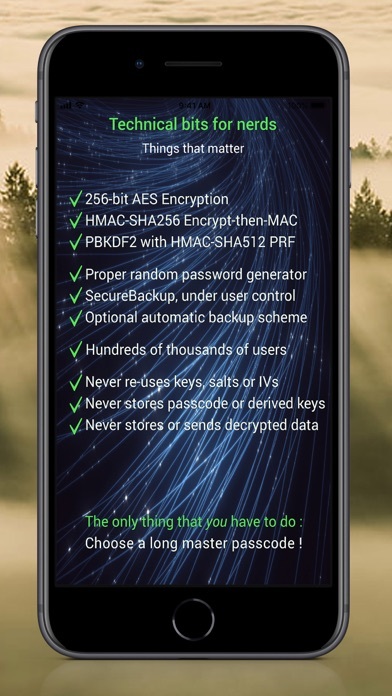 + Duress-protection for biometricID users: If you are under duress, shake your device or quickly hit Cancel instead to completely disable biometric access to The Vault. From this point on it is technically *impossible* to access to your Vault without first manually entering your passcode.